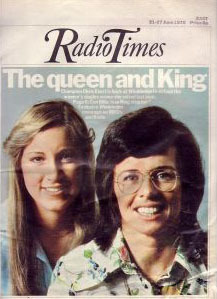 Billie Jean King really put Women’s Tennis on its feet, but it was Chris Evert who ran it up to the top of the mountain and lit the victory fire, as the country club sport went mainstream and worldwide with the explosive popularity of “The Tennis Boom” led by Evert & Borg. And she did it with style, grace, dignity, tireless grit, and a flurry of two-fisted backhands that got people all over the planet to pick up racquets and try their hand at playing this sport, inspired by Evert’s example of what tennis could be. Bringing in the crowds, and maintaining a legitimizing standard of play, Evert was the knight in shining armor for a sport that, to its true devotees, is much more than a sport, but more akin to an eastern discipline. Tennis is about personal courage and heart, facing down whatever challenge may lay in your path, finding the willingness and determination to fight past whatever you are going through, and all along, being the sole missionary of your own fate: a game about taking full personal responsibility. The toughest matches are like running wild into the woods during the night with no flashlight and slowly putting together all the subtle clues found in the dark in order to make it back home. And after the trophy is placed in your hands and that on-court moment is gone, the rewards are all internal, and again, belong only to you. And, of course, to the millions of fans that may have been watching you all across the globe! That’s the unique thrill of tennis. But as tenacious as she was on-court, the need for a comeback in awareness of Evert’s particular qualities as a player is as important for today’s game as when she first drew attention to the sport’s possibilities as a teenager over 40 years ago. Class. Courage. Elegance. Integrity. Consistency. Tenacity. An unwillingness to concede a single point. And the respect to others extended through her gracious sportsmanship, of never rubbing her accomplishments in her opponents face after a point – or after a match – was itself legendary. These are all timeless traits that will always be relevant to the sport of tennis, which none exemplified as completely, and for as long, as Christine Marie Evert. There have been players who exemplified raw power more, aggressiveness more, daring more, spontaneity more, expressiveness more, and certainly net agility more. But there was a royal air in how she exuded a calm, composed and yet impenetrable steely willfulness on court that made people refer to her as “The Queen”..when not acknowledging her as the Ice Princess. 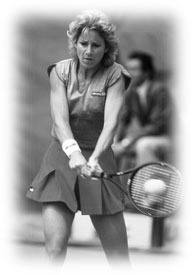 In addition to her heralded powers of concentration and unflappability, Evert was remarkably fleet of foot, knew how to utilize the dimensions of the court to take advantage of the playing surface, and also to set herself up to create winners which on some occasions caused commentators to gasp, “I don’t believe that angle exists!” With such precise footwork, she was rarely caught out of position, and could also dictate the pace of the match from the back of the court, “going to net only to shake hands and pick up the winner’s check” as commentators often would remark..though a peek back at the footage in every year of her career confirms she always made calculated approaches to the net to finish a point. And she was beautiful to watch, with incredible grace and precision of movement and stroke production, Evert was a “living textbook” of correct, proper shot structure. Not like a gazelle-evoking Suzanne Lenglen, but more akin to the awe one feels from witnessing the perfection of a Draftsman’s masterpiece. Her game was economical in how little effort her strokes took out of her to hit in relation to how much power and accuracy they generated. Another key to her consistency was her superior racquet preparation. The moment the ball left her opponent’s racquet, Evert rotated her shoulders towards either the forehand or backhand side. This early preparation helped her mobility in getting set and planting her feet to fully engage the ball, and gave her extra time to decide how to attack or trick her opponent. Because she hit the ball so squarely, and exaggerated her follow-through on both forehand and backhand sides, she succeeded in clearing the net with remarkable regularity. She also kept her opponent pinned at the back of the court by hitting with a penetrating depth that landed inches from the baseline. This kept her opponent both on the defensive and in the unadmirable position of having to continue to play on Chrissie’s terms. Once she got on top of you, it was quite a task to wrestle yourself free to begin taking charge of the point. And Chris was a master at changing the pace with a lob, her famous drop shot, or a sudden shift in direction to get the rally back under her control. Net rushers had the best chance against Evert because at least then she may get her rhythm thrown off, feel rushed, and begin to worry more about the position of her opponent on the opposite side of the net, than just seeing the ball in front of her and continuing the onslaught. With that said, Chris did love a target, and unquestionably had the best lob in tennis history, especially when used offensively, and had unerringly sturdy passing shots off both wings. A short approach shot would set Chrissie’s groundies on automatic pilot to any open corner of the court. You approached at your own risk. While the sun did finally set on the Evert Era at the close of the 1989 season, the importance of all that Chrissie brought to the game still remains. But often stands in contrast to so many advents of the modern era: with tennis balls having been altered to move even faster than they used to, while being hit with racquets that increasingly take the place of discipline to hit effectively, with strings that further enhance the impact of spins and the power of velocity over the powers of the mind, strategy & focus, in determining the outcome of a point. The personality of the game itself – and the characteristics it takes to excel & succeed in the sport – have been unquestionably altered. But Chrissie remains front & center. 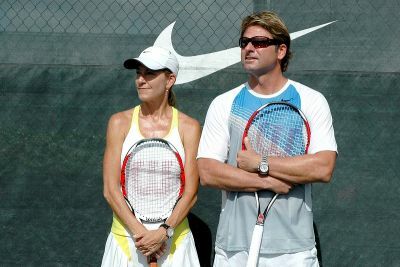 In addition to sharing her views on the modern game as a commentator for both ESPN and Eurosport, Chrissie is sharing her passion for aspects of the sport that she utilized to such great effect during her playing career, as she helps teach and form the next generation of tennis players at the Evert Tennis Academy, with brother John Evert. It is incredible that the Evert Tennis Academy has become the official USTA National Headquarters for Player Development. 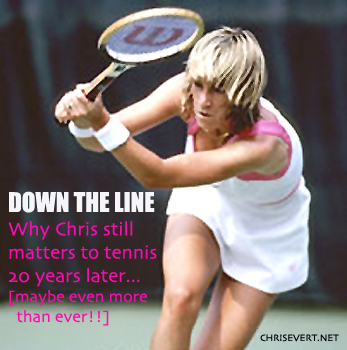 Certainly, it is an amazing thought for anyone who remembers Chrissie’s influence on everything in the game of tennis to consider what it means now for her Tennis Academy to serve such a crucial role in investing directly in the USTA and the future of American tennis today. The Evert Tennis Academy works not only on the tennis strokes and fitness aspects of the sport, but on strategy using video analysis, teaching mental conditioning, sports psychology, and offering yoga; all to comprehensively enhance the full awareness, effectiveness, and inner-calm of the player. EVEN THE HORSE WAS A CHAMPION!